An annual staple in the city, the Seattle International Dance Festival brings together dancers and choreographers from around the globe for a three week festival. Presented at Raisbeck Hall on June 18, the second weekend of the festival’s Inter|National Showcase featured choreography from both local and far flung dancemakers. The evening opened with See & Be Seen, by Sam Picart in collaboration with Cheryl Delostrinos; both are Seattle dancers and choreographers. Showcasing six dancers—all students from the Threshold Institute, a week long intensive organized by SIDF—the piece was full of detailed isolations and hip-hop style movements. It served as a reminder that SIDF is not just performances in a theater, but also an opportunity for local dancers to grow. It was especially nice to start the performance with local up-and-coming talent. Deborah Wolf, a current faculty member at Cornish College of the Arts, offered two works, Three-Piece and Quake. The former, a trio, had a clear balletic influence in its grounded and circular movements. There was a sense of a home base throughout the piece, with the dancers consistently returning to stage left to regroup as individuals and as a whole. The three dancers—Jessica Klein, Sean Rosado, and Sean Tomerlin—all fully embodied the choreography with strength and control, even when the movement became more frantic. 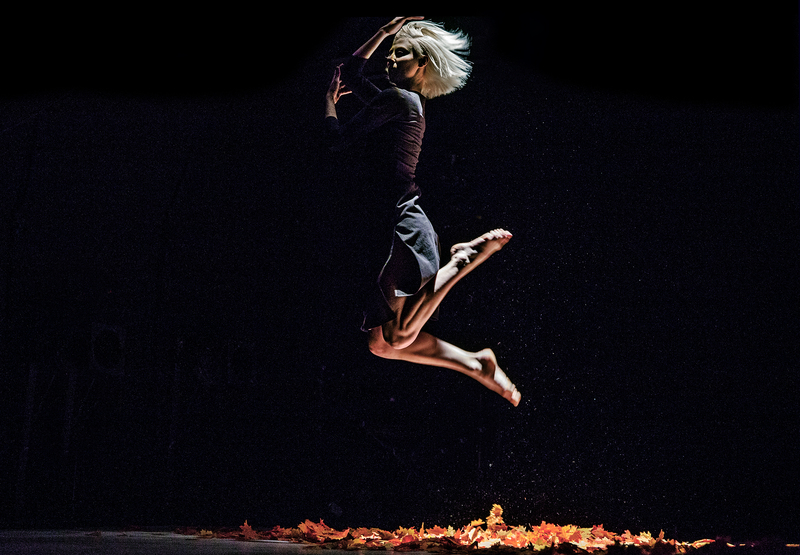 With ten dancers, Quake gave a different perspective on Wolf’s work. Though the choreography often referenced itself and featured ballet-inspired movements like in Three-Piece, Quake took a literal and straightforward approach. The costumes, black tops and white and grey leggings, blended in with the white marley floor, obscuring the dancers’ strong technique. While the continuous energy of the piece became monotonous at times, it had a clear build to a finale and made a satisfying end to the evening.